>>> taking new hits over his proposed jobs bill. this is one of the front runners in the gop presidential race traveled to new york for a high profile meeting. nbc's political director and chief white house correspondent chuck todd has details. >> reporter: the week is not yet over but signs are the president is still struggling to sell this jobs bill, even now as congressional democrats are beginning to raise concerns. for the obama white house , it's been a week of bad news. from the special election losses in new york and nevada to those capitol hill hearings looking into why one of the president's signature stimulus ideas, green jobs , hasn't come to fruition, to a new poll showing a majority of americans doubt the president's proposed jobs bill will have any impact on the struggling economy. it's a bleak backdrop for the president's jobs push. >> reporter: making his third trip to a swing state since friday, the president wasted no time in challenging congressional republicans. >> they like to talk about how we're in favor of america 's jobs creators. you know what? if you're in favor of america 's jobs creators this is your bill. >> republicans aren't buying it. jim demint called the president's pitch a trap for the gop. >> if we vote for this plan we'll own the economy with the president. he desperately needs someone else to blame it on. if we vote against it, he's going to try to say congress blocked his ability to create jobs. >> reporter: even some democrats acknowledge the political pressure on their party, pointing to the new york city special election defeat as a red flag for 2012 . >> the message, once again, came loud and clear. get to work putting america back to work. 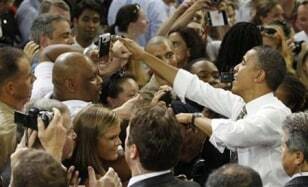 >> reporter: some obama supporters are worried there's a disconnect between the president's likability and the fact that some voters are simply giving up on him as a leader. >> he has to prove to people that he's a strong leader, a decisive leader, and he's bringing back the economy and unless and until he does that, it doesn't matter that people personally like him. >> and i think the american citizens are just tired of all of this, you know, political correctness and politicians who are tiptoeing around important issues. they want a decisive leader. >> reporter: perry spent his day wooing evangelicals at jerry falwell 's liberty university , then went to new york to woo celebrity businessman turned tea party activist donald trump . the two hob nobbed with models at a fashion show and went to dinner at the swanky restaurant john george 's, a much more formal affair compared to trump's pizza party with sarah palin in july. and today the white house got a little bit more bad news when it comes to his jobs bill. a handful of senate democrats are saying, you know what? let's not take it all up at once. let's take it piece meal, the exact same things republicans said a few days earlier, matt. >> chuck todd in washington for us this morning at the white house . thanks very much. President Obama greets supporters after speaking at North Carolina State University about the American Jobs Act that he unveiled in an address to a Joint Session of Congress last week while in Raleigh Durham, September 14, 2011.